GM's plant in Bowling Green, Ky., employs 753 hourly workers. General Motors plans to invest $439 million in its Chevrolet Corvette plant in Bowling Green, Ky., as part of the automaker’s plan to spend $5.4 billion on U.S. factory upgrades. The Corvette plant will get a new 450,000-square-foot paint shop -- 200,000 square feet more than the current shop, a GM spokesman said today. Construction on the new shop is set to begin this summer and is expected to wrap up in 2017, GM said in a statement. The addition is not expected to create any jobs; all existing jobs at the plant will be retained. This announcement comes as GM prepares to conduct negotiations with the UAW this summer. “This new paint shop will mirror the efficiencies and technologies of the new body shop, installed with the launch of the Stingray,” UAW Vice President Cindy Estrada said in GM’s statement. 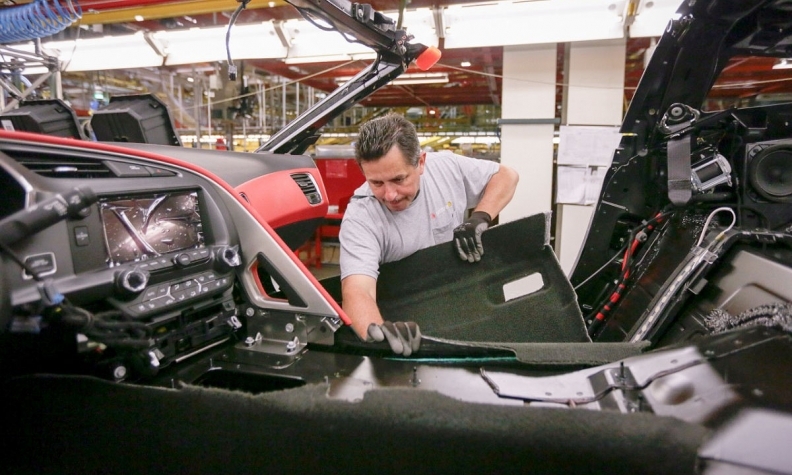 In addition to the new paint shop, GM has also invested about $135 million in the plant over the last four years in preparation for the Corvette Stingray and Performance Build Center. GM has made or announced $16.8 billion in investments at its U.S. facilities since emerging from government-backed bankruptcy in June 2009.